Life by the Day | Parenting after infertility (and lucky IVF cycle #5)…and just trying to enjoy life, one day at a time! So amazed, impressed, and thankful for the Boston law enforcement community. 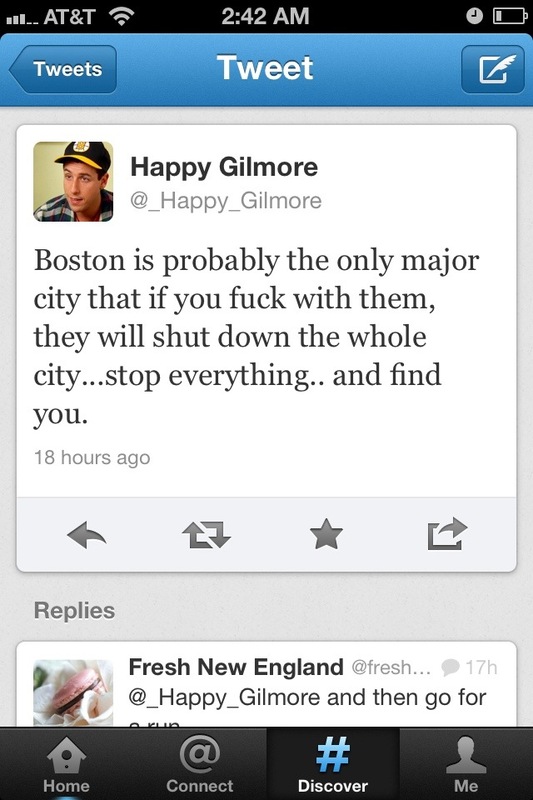 Thank you for everything you did so the people of Massachusetts could sleep soundly tonight. The events of Monday at the Boston Marathon have prompted me to come out of my unintentional retirement…not because I think I have anything of value to share, but because I need a place to work through my feelings and emotions. As a self-described Catholic, I struggle with events like this. Events like this – and the doubts they raise in my mind – make me question my right to call myself a “good” Christian or a “strong” Christian, but I definitely am a true Christian. I know for sure that evil does not come from God, nor does he “allow” it, but that evil exists in the world despite God’s best efforts. At the same time though, I struggle with the sentiment that this is all God’s plan. I do not believe that he “plans” for things like this to happen…for people to die or be maimed…but I do believe that he lifts up those that he can and sets them on a path of meaning. I choose to believe that the three people who died were chosen by God, not because they didn’t “deserve” to live, but because he knew they would be better off with him. I choose to believe that the first-responders and doctors were God in the flesh that Monday afternoon, saving as many people as they could. I also choose to believe that whoever committed this heinous act was acting on behalf of the devil and will join him in hell upon their death. I’m using the word “choose” very carefully here. It has taken me all week (and the writing of this post) to wrap my head around how anyone could be so evil as to hurt children or people who were already at their physical (and mental) limits…and the only way I can make sense of it is to believe that the person who did this was truly the devil incarnate. At this point all that is left to do is pray for peace in the city of Boston and for healing of those who were physically, mentally, or emotionally injured (both here and in Texas). Please join us for “wear Boston” day tomorrow, and wear anything you have that shows “Boston,” one of our sports teams, or any of the Boston or BAA/marathon colors. May God bless America and all those who strive to make the world a better place. 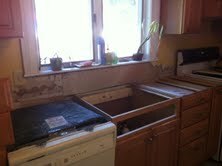 …and we’ll be another full week without a kitchen sink or countertops. Oof. Why is it that my body is fighting me every step of the way back to getting in shape? It is no longer negotiable…I was just recently asked “so you’re working on #2, huh?”, COMPLETE WITH BELLY RUB! Seriously?!? I’m blaming it on my mini alcohol binge post-BFing, so no more bottles of wine on weekday nights, but I’m still annoyed that I can’t work out like I used to. Whenever I try, I’m so sore the next day (or two!) that I can barely move or pick A up! So now I’m trying to do less (end my workout before I feel completely “worked”) but more often. I finally got around to reading Bringing up Bébé (I recently decided that I didn’t have much of an excuse to still be reading the crap that I used to read to “relax” while working/pregnant/etc.) and was extremely gratified to realize that I’m somewhere in the middle of the French and American contingency. My goal in raising my kid(s) is like the French cadre – strict limits about certain things with a lot of freedom in between. I believe strongly in independent play, manners, and helping your children become good eaters (more French than American per the author). However, I’m a proud breastfeeder, and am also completely guilty of narrating A’s actions and praising their results (all good things I think, albeit more American). I still think that it is a good idea to have goals though. A lot of the things I had already been doing (or trying to do), but the book made me realize how much I still rely on things like snacks and A’s pacifier to prevent shrieking and meltdowns while in public. So that’s my new goal – help A try to get more words so he can express himself without screaming, and not just shove food into his mouth to shut him up. 😉 If you hear a toddler yelling from across the store or restaurant, think of me and wish us luck, okay? Also, will all you readers out there send me some book recommendations? Any parenting books that you’ve found particularly helpful or other new fiction/non-fiction that I should read. Thanks! 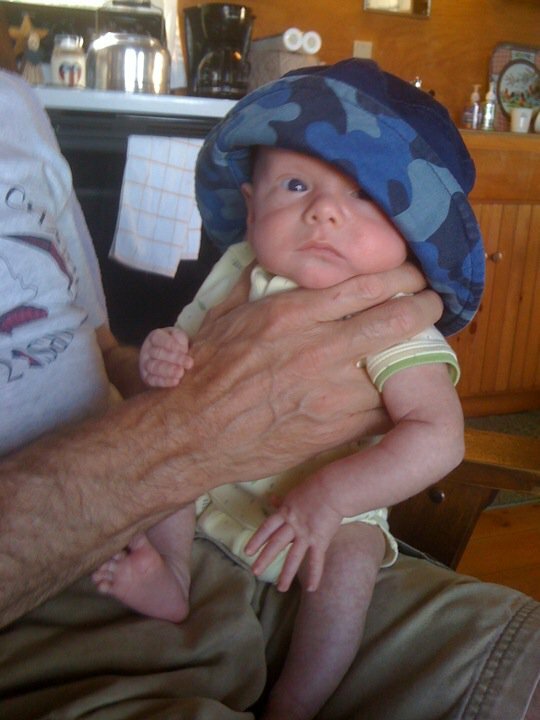 Soon after A’s birthday, my freelance work dried up (more on that later) and I became a bona fide SAHM. Around the same time, A became more mobile and began refusing to stay in his playroom (a small gated area off our main living room). I looked around and realized that our house was a DISASTER – not child-proofed, not clean enough, and FULL of clutter. When I was working full-time (and even part-time), everything got done “enough” – clean enough, organized enough, just good enough. But once A was crawling around on the floor full time, I knew things had to change. And to be honest, I had NO idea where to start. I think my exact search phrase was “how to organize your life.” 😉 And the website I came across was nothing short of life-changing. It’s called FlyLady.net and has a whole host of guidlines, routines, and prompts to help you conquer the CHAOS (can’t have anybody over syndrome)! It’s set up so anybody can use it – SAHMs, working parents, retirees – and written in a way that breaks through the guilt and procrastination and sheer overwhelmingness (is that a word?) so you’re able to jump right in. They divide your house into zones with a different zone focus each week (for more detailed cleaning), and then every day there is a cleaning or decluttering “mission.” They also encourage you to set up weekly routines (certain days for errands, paperwork, cleaning, etc.) and every month there is a different “habit” to focus on (laundry, drinking water, etc.). That is just a snippet of the value the site offers, but honestly guys? I have never felt this in control of my life. I know that I’ll be able to keep up with it, even when my freelance work picks back up, and I foresee our family using these guidelines and routines for years to come. This is not a paid advertisement for FlyLady.net. The FlyLady has no idea that I exist…I just had to share my great find with all of you! I won’t even apologize this time…let’s just all agree that I’m a terrible blogger and move on. There are some major psychological issues underneath my lack of blogging and I’m not quite ready to explore them. 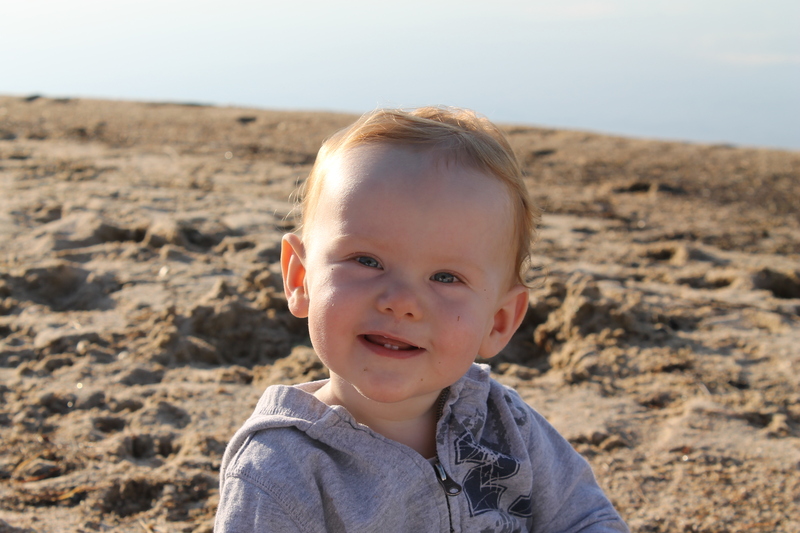 And while we’re playing ostrich, let’s ignore the fact that I just finally acknowledged (on this blog) that my son is now a toddler. 😛 So ANYWAYS…what’s A up to at 14 months?!? He’s starting to think and understand so much more now. He understands (and obeys!) when I tell him to sit down, and now he’ll actually come into the kitchen and point to the fridge and then sit down on the floor while I get him his milk. 😉 He still doesn’t have many words (hi and dada are in main rotation), but he does a lot more grunting and pointing now. And the cutest part is that if you guess what he’s trying to say, he does this cute little sigh thing, almost like he’s trying to say “yeah!” accompanied by a huge smile. I spend a lot of time pointing things out and practicing words and sounds…I don’t want him to be short-changed stuck at home with just mama! Now that A can MOVE, he has lost all interest in his toys – spices and pans and remotes are much more fun. 😉 And he gets bored with home much more easily, so we’re going on field trips a lot more often lately. It’s so hot out (and A is so fair) that I have been trying to avoid just hanging out outside, but he definitely needs more entertainment now. He hates sitting down in the tub lately, so the baby pool is out too. 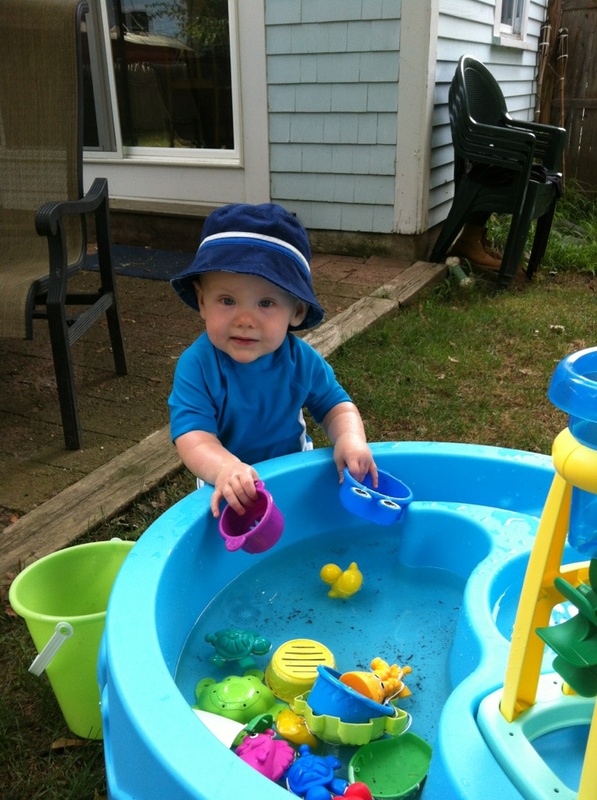 But we got him a water table with his birthday money and he loves it! We officially have a TODDLER! I wrote this post months ago, but never finished or posted it…I’m pressing publish without making any edits so I don’t stall anymore. I honestly can’t believe that a year has flown by already, and am having a hard time processing my emotions…especially when I think that we were still in the NICU at this time a year ago. I wish I was one of those people who got more eloquent when filled with emotion (a poet I will never be)…instead, I become almost mute, with all of my emotions bouncing around inside of me, not able to put my feelings to words. It’s annoying. I love writing, and would love to be able to express myself (maybe even write a book some day), but I’m so much of a perfectionist that I become crippled with the need to formulate my thoughts perfectly. He finally starting signing “more” around 11 months. Since we started it at meal-times, it has come to mean both “give me more food” and “I’m hungry”, so I’m now focusing on the sign “eat” when we start eating, and using the sign “more” as part of play-time. Other signs that we’re working on are “all done”, “milk” and “water”. In fact, signing “more” led to his first time standing on his own (since he needed both hands to make the sign)! We started weaning at 11 1/2 months and it has happened pretty organically. We started with milk at his afternoon snack and he sucked it down in his sippy cup like he had been drinking milk his whole life! The mid-morning feeding was the next to go, followed by lunch. He’s still not drinking much milk during the day (always does the best in the afternoon), so consequently our morning and evening nursing sessions have gotten a bit longer. I’m having a hard time figuring out which one to drop next…he seems to want both for the time being…but we need to be completely weaned by the end of June. S and I are leaving him with my parents for five days and taking a trip to California! He doesn’t mind sand, but HATES grass. Whenever we put him down on the grass to try and take a picture or whatnot, he literally picks up every one of his limbs off the ground and whines until we pick him up. I’m trying to make sure that he’s not OCD like his mother, so that’s what we’re going to be working on throughout the summer. Even if I put him on a blanket surrounded by his favorite toys, he’ll play with the grass but WILL NOT crawl on it. It may as well be an alligator infested moat, lol!